How do you review a book which is all about pictures? It is easier to review it you might think. Even I thought so. But here I am, trying to search for words to review a book that had not a single word in it but was full of emotion and a great story to tell. The Arrival by Shaun Tan is one such book and trust me when I say that beautiful doesn’t even begin to cover it. The Arrival is a story told in pictures and nothing else. Come to think of it, nothing else is needed sometimes to tell a story but pictures. Words but after all are secondary to emotions and if emotions can do the job, then really why speak at all? The Arrival is a story of the “immigrant experience”. There are some books that grab you by the throat and some that change the way you think, while there are others who instantly shock and awe you. The Arrival belongs to the last category. I have never read anything like this book that in essence places the reader so perfectly in the shoes of an outsider, trying to fit in and be a part of the new world, so to speak. 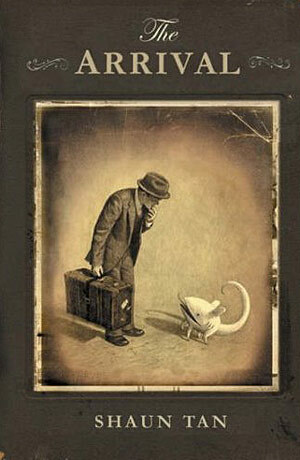 Shaun Tan is an illustrator to start with and what an illustrator that man is. Shaun Tan has created a world that is not only strange to us but also the protagonist. A man leaves his home for the new world. The assumption is to make money. Once he arrives in the strange world, he cannot help but be in awe of it. Everything is different. From pets (with strange tails and ways and resemble cats and dogs and butterflies and pigeons) to language to mode of transportation and the way they live in cone-shaped structures to what they eat. Here the man meets other immigrants and knows of their stories of escape and how they arrived in this land. Amidst all this, he learns more about this land and grows to love the tadpole like creature that follows him everywhere (almost like a dog). Towards the end, his family has arrived and we see how they have grown to love the city and be a part of it. For me the beauty of the book lay in the pictures. Having said that, with every page I turned, I was fascinated by the author’s thought-process. What must have gone through the illustrator’s mind to tell a story like that? A story so fantastically real, and depicting the universal emotion of facing something strange or new. The book is remarkable and I was in total awe of it. The images are not difficult to decipher – they make you stop and wonder about how the imagery must have formed in the illustrator’s mind and with such lucidity it is put on paper. The Arrival has been one of the best books I have experienced this year. I say experienced because there is no other way to describe it. The book takes you on a different plane. It is beyond words and thank god for it. Because there are times when you do not need words to tell everything. The Arrival is a book with a soul. Read it and experience it. This entry was posted in Arthur A Levine Books, Books, Graphic Novel, Review and tagged Arthur A Levine Books, Country, Graphic Book, immigration, Loneliness, Picture Book, Shaun Tan, The Arrival on May 25, 2012 by thehungryreader.